Two aerial black and white photographs give us quite different views of Broughton House and Oak Farm. 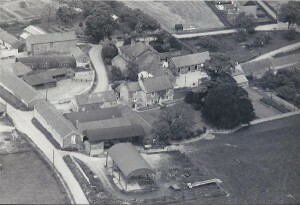 On the left is a 1963 view taken of Oak Farmhouse with its buildings in the foreground and Broughton House centre towards the top of the picture. Some of the houses in Beech Crescent are just visible at the top right. The photo on the right is believed to have been taken pre the mid 1930s because of the lack of electricity poles. This shows the extent of the farmyard which once went with Broughton House. On the far right can be seen part of the large walled garden. Broughton House is at the bottom left with Oak Farm buildings further up on the left. It is difficult to see but it looks as though maybe a wall or hedge forms a boundary across what is nowadays Beachcroft Lane. On the other side of Main Street are the farmhouse with buildings which was once Holme Farm. This has since been developed to become Blacksmiths Yard. On the right of Holme Farm are the two cottages today known as Hope Cottage and Broad View. 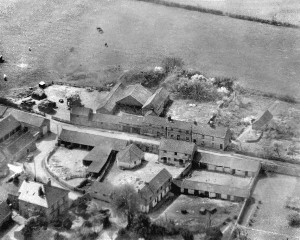 Both the stable block seen behind Holme Farm and a similar sized one-storey building to the right of Broad View still exist despite various developments since these photos were taken. Parts of the wall which ran alongside Broughton House farmyard and the walled are also still standing. These two photos start a journey through the older properties in the village, listing in most cases the people who once lived in them. So this is also a section about people. Anyone who feels their property (or they) would like to be included is invited to submit written details and where possible photographs. Older photographs are particularly welcome.